LABOUR OF LOVE: The Spencer family is running their fourth and final fundraising walk in honour of Corio man 'Johno' Spencer in March. Left daughters Kim McCallum and Nicole Haustorfer, wife Sue Spencer walk founder Bek Spencer. A Geelong family hopes its fourth and final Walk for Johno will be the biggest ever as raise money for heart research and education. Corio’s John ’Johno’ Spencer died suddenly aged 63 from a heart attack four years ago, with his family establishing the walk in his memory. Founder, organiser and daughter Bek Spencer said her dad’s death shocked wife of 43 years Sue, their three daughters, eight grandchildren and many other family and friends. But the family was determined to turn their heartbreak into something positive, Bek said. “We were devastated by dad’s death because we had no warning that anything was wrong. “He loved walking, was very active and heavily involved in the local community. It was a total shock. Walk for Johno was a celebration of her father’s life as well as a fundraiser for The Heart Foundation,“ Bek said. “Many people have been impacted by heart disease, and by coming together we continually build support and awareness of this critical issue in our local community. One Australian died of heart disease every 28 minutes and many more lived longer with chronic cardiac illness, said the foundation’s Victoria chief, Kellie-Ann Jolly. The 2019 event will follow the Bellarine Rail Trail from Queenscliff to East Geelong’s Eastern Hub beginning 7am on 16 March. Registration is free. “The walk has four different options from 3km to 35km, so there’s something for everyone and every fitness level,” Bek said. 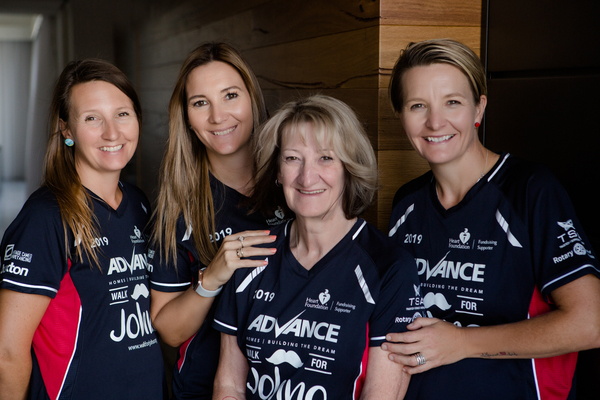 This year’s Walk for Johno” would be the last because Bek was “juggling my time between raising two young children and teaching four days a week”, she said. Past walks since 2016 had been “a huge success“, Bek said, with over 500 people walkers so far raising more than $73,000 for The Heart Foundation. Bek said more information was available at walkforjohno.org and on the event’s Facebook page.